Brian Scalabrine is a former American professional basketball player who played in the National Basketball Association (NBA). He played for teams like New Jersey Nets, Boston Celtics, Chicago Bulls, Benetton Treviso as their power forward. Currently, he co-hosts "The Starting Lineup" on SiriusXM NBA Radio as well as works as an analyst for Boston Celtics games on local Boston broadcasts. As an analyst, Brian David Scalabrine reportedly earns around $60,000 as his yearly salary from Boston Celtics. Further, Brian David Scalabrine has an estimated net worth of over $10 million. As of 2019, Brian David Scalabrine has an estimated net worth of over $10 million. Further, he currently has an average salary of $60,000 annually, working as an analyst for Celtics games on local Boston broadcasts. His last contract as a player in NBA was with Bulls in 2010 for 1 yr(s) worth $1,352,181. During his playing career, he made the career earnings of around $20,126,688. Kept aside Brian David Scalabrine financial earnings, his personal assets includes a Home in Winchester, MA. Other than being a former NBA star, Brian David Scalabrine is pretty famous in social media. He has 78.8k Instagram followers and 105k Twitter followers. Brian Scalabrine is married man. He tied the knot with his long-time girlfriend, Kristen Couch. The couple walked down the aisle in Hawaii in 2003. Together, with his wife, they have two children. Brian Scalabrine currently resides in Winchester, MA with his family. His relationship with his wife is going on strong as ever without any rumors of external affairs and divorce. Besides, he is also involved in charity works and is a member of the organization Athletes for Hope. Brian David Scalabrine was not only a world-class athlete but also has a very attractive individual. The Famous NBA star is 6 feet 9 inches in height and weighs around 107 kg. 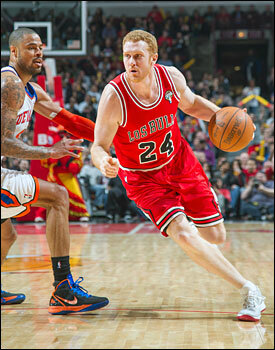 Brian David Scalabrine was born on March 18, 1978, in Long Beach, California. He was one of the four children (including two brothers and a sister) of his parents. As per his nationality, he is American and belongs to Italian ancestry. Further, his star sign is Pisces. Brian David Scalabrine attended Enumclaw High School in Enumclaw, Washington where he played for his high school basketball team. After completing high school, Brian David Scalabrine enrolled at the University of Southern California (USC) and played for the USC Trojans men's basketball team. Brian made his NBA debut on January 31, 2002, for the New Jersey Nets against the Milwaukee Bucks. As a rookie, he averaged 2.1 points, 1.8 rebounds, and 0.8 assists per game and played in six playoff games his debut season and averaged 0.3 points and 0.5 rebounds. During his time with the Nets, he earned the nickname "Veal", a play on words based on the dish veal scaloppini. On August 2, 2005, Scalabrine signed a five-year, $15 million contract with the Boston Celtics. He played in nine of 48 games during the 2007–08 season, and played on average 10.7 minutes recording average score of 1.8 points and 1.6 rebounds per game. In September 2010, Scalabrine agreed to a non-guaranteed contract with the Chicago Bulls. He played 18 games with the Bulls, averaging1.1 points and 0.4 rebounds per game. On September 22, 2011, during the 2011 NBA lockout, Scalabrine signed with the Italian team Benetton Treviso and left the team in December 2011 to work in NBA after the lockdown. On December 12, 2011, Scalabrine re-signed with the Bulls and played in 28 games during the 2011-12 season, In September 2012, he was offered a position as an assistant coach for the Bulls under Tom Thibodeau, but he instead chose to work as a broadcaster for the Boston Celtics. In July 2013, Golden State Warriors then-coach Mark Jackson announced via Twitter that Scalabrine was joining his coaching staff and he reassigned Scalabrine to the Warriors' D-League affiliate.